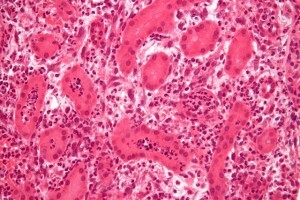 Pyelonephritis is a serious infectious disease of the renal parencyma and pelvis. It is usually caused by the migration of lower urinary tract bacteria. Pyelonephritis is a serious infection that can progress to septicemia or renal scarring and chronic renal failure. 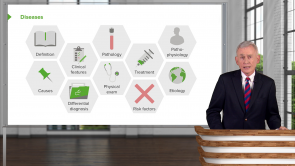 To know more about pyelonephritis, join our online course now! Bacterial infection is the most common cause of pyelonephritis. Acute complicated pyelonephritis is an acute emergency and needs immediate treatment with intravenous antibiotics. Infection in acute pyelonephritis is usually due to ascending infection, or due to hematogenous infection. The presence of recurrent infections, usually due to structural and functional anomalies in the genitourinary tract is the hallmark of chronic pyelonephritis. Clinical features include fever and abdominal flank pain with or without symptoms of cystitis. WBC casts are the characteristic findings seen in the urine analysis. Fluoroquinolones and cephalosporins are the mainstay in the treatment of pyelonephritis. Prognosis is excellent in uncomplicated pyelonephritis, while it is poor in emphysematous pyelonephritis. concise, really easy to listen to. Gave salient points very well. Loved the pause for thought on the red flag of having a staph aureus urinary tract infection.